Today’s post-conflict Colombia is enjoying a meteoric boom in tourism, fuelled by visitors’ seemingly insatiable appetite for its Andean peaks, Caribbean beaches, Amazon jungle and lively urban centres. At the heart of all this is Bogotá, Colombia’s sprawling capital, subtly reinventing itself as one of South America’s trendiest destinations. 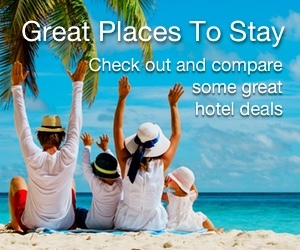 With the cartels and criminals on the run, there’s never been a safer time to visit. 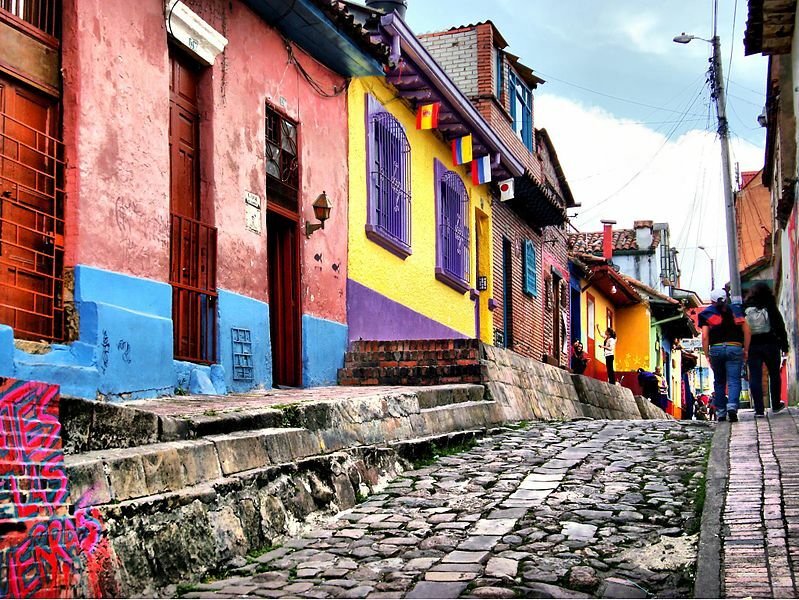 Leave any irrational apprehensions around personal safety at the arrivals hall and dart straight for the city’s historic centres in Usaquén and La Candelaria. 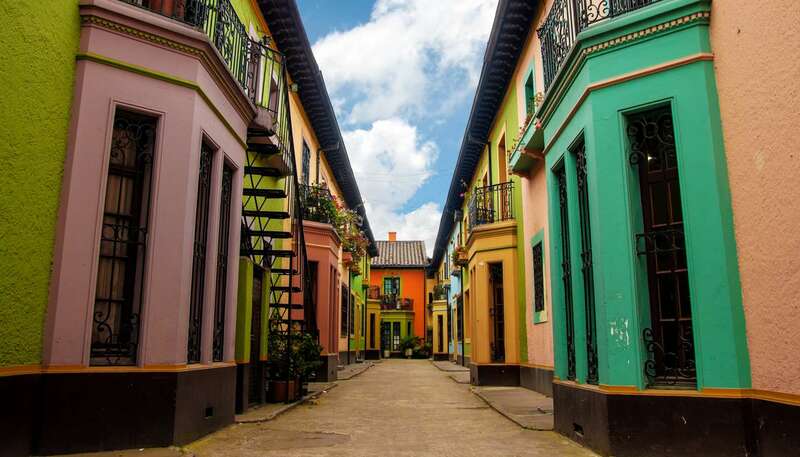 These colourful colonial districts, founded by Spanish conquistadors in the 16th century, have cobblestone streets punctuated with major historic landmarks. The great riches of the bygone colonial era are best seen at the Banco de la República Gold Museum, which has an extensive stash of gold pieces from almost every major pre-Hispanic culture to grace Colombia. Other essential sightseeing highlights in Bogotá include the impressive modern art collection at Botero Museum and the well-stocked shelves of Luis Ángel Arango Library – home to more than one million books. But you don’t have to be a bookworm to swat up on the city. Our Bogotá travel guide will get you started with information on routes into the city via El Dorado International Airport. Home to more than eight million people, Bogotá is one of the largest cities in the world without a metro system. Thankfully its cheap, electric-powered TransMilenio bus network is unrivalled in the Americas for size and efficiency, carrying more than two million passengers every day. Colombia’s fiery fiesta scene is the stuff of legend and the country’s capital doesn’t disappoint when it comes to after-hour options. Armando Records ranks among the hippest hotspots in town. An amalgam of record label, gig venue and club, Armando’s legendary rooftop parties only really get going from 11pm, when most Bogotános are ready to rumbear – Colombian slang for going partying. Bogotá’s nightlife truly offers a smörgåsbord of options, catering to almost every taste. Those with a thirst for hops should pay a visit to Bogota Beer Company, an artisan brewery with nearly 20 establishments across the city. While those with a flair for latino dance moves should experience the live salsa bands of Quiebra Canto, a club that attracts some of Bogotá’s best dancers every Thursday, Friday and Saturday night. Beyond its rhythmic dance scene, Colombia has a strong culinary heritage and it’s not hard to find excellent Latin American fare along the streets of Bogotá. In fact, no visit is complete without trying the tamales colombianos – a street food classic. For the best homemade Colombian dishes, and chance to eat out on a roof terrace overlooking the sea of terracotta tiles and narrow lanes that make up Bogotá’s old city, a visit to Restaurante Fulanitos is essential. Our Bogotá restaurant guide has recommendations for every budget and palate, as the cuisine options available here seem ever-expanding; Peruvian, French and Asian fare are all easy to find. After a long and no doubt tiring day exploring the city often dubbed “The South American Athens”, there’s a hotel bed in Bogotá with your name on it – whatever your budget. For a five star experience, check in to the palatial Four Seasons Hotel Casa Medina Bogotá, recently declared a monument of cultural interest by the Colombian Ministry of Culture. At the other end of the scale, Abitare 56 Hotel is a bright, modern establishment with affordable rooms and free breakfast buffet included in the price. Explore a range of recommended accommodation choices with our Bogotá hotel guide, or check out the best hotel rates in Bogota here. For an unforgettable day trip out of Bogotá, take a local bus to Zipaquirá, a city famed for its Catedral de Sal. 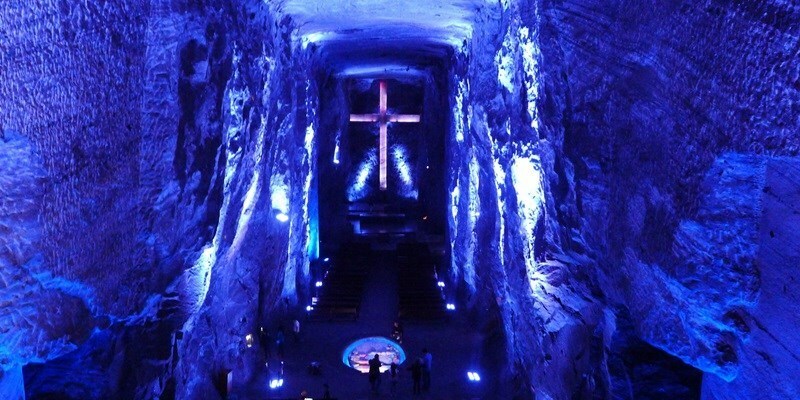 This huge cathedral complex, some 180m (590ft) underground, is carved entirely out of salt. Located right at the heart of a disued salt mine, the three-nave church extends along an incredible labyrinth of tunnels, connecting a series of smaller chapels.